The nominations for the 30th Annual Razzie Awards--the best of the worst!--have been announced. 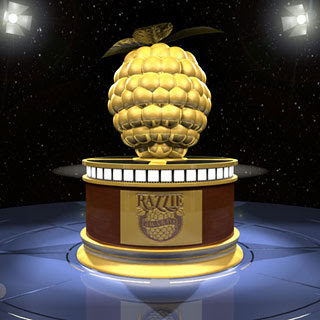 The Golden Raspberry Award Foundation have sifted through last years cinematic rubble and selected what they consider to be last year’s Berry Worst “Achievements” in Film. The awards show is scheduled to air Saturday, March 6 at 7'30pm/PST - a now traditional Night Before the Oscars. Below you will see a full list of nominees and I also hi-lighted the ones I think will win. G.I. Joe: The Rise of Cobra, Screenplay by Stuart Beattie and David Elliot & Paul Lovett, Based on Hasbro's G.I. JOE® Characters. I vote kristen as teh best sisiter in the whole world!!! How would you know Shawty? I can be very mean and selfish!